A Briton who devours eight hotdogs for breakfast has won the dubious accolade of being named the world’s fattest man. Keith Martin, 42, tips the scales at 58 stone, and is so large that he is bed-ridden. His needs are putting an extra drain on NHS resources and costing the taxpayer thousands of pounds as he requires an army of 18 medical professionals to look after him, including ambulance staff, carers and nurses. Eight ambulance workers must be on hand to help hoist his giant frame to a reinforced vehicle for frequent hospital visits close to his home in Harlesden, North-West London. Trips for health checks are the only occasions in the past ten years on which he has left his bed. He also requires four carers to visit him twice a day and four nurses three times a week to wash him and monitor his health as his staggering weight is putting massive strain on his heart and other internal organs. Medics say he would need to shed half his bulk before he could even be considered for a gastric band to aid his weight loss. Mr Martin took the crown of heaviest man on the planet after the previous title-holder – a 90-stone Mexican – went on a crash diet. Manuel Uribe, 44, is still listed as the heaviest man in the Guinness Book of Records but is believed to have shrunk to a relatively svelte 31st 6lb. Mr Martin has also overtaken another former world’s heaviest man, fellow Brit Paul Mason. Mr Mason, a 51-year-old former postman from Ipswich, slimmed down from 70st to 49st after being warned he was dangerously close to death. 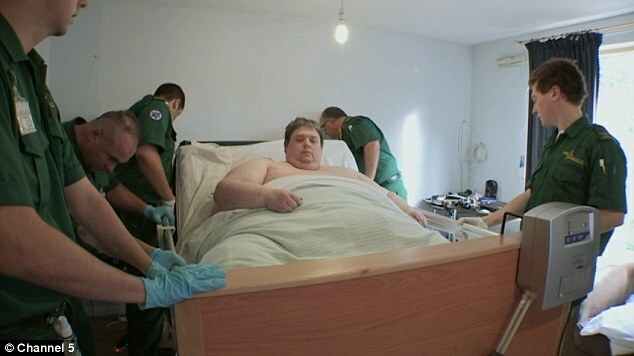 At the height of his binge-eating, Mr Mason would consume in excess of 20,000 calories per day and would be wheeled to local takeaways daily by his carers. By 2002, he was so big that a 5ft window at his former home had to be removed and a forklift truck brought in to lift him when he needed to go to hospital for a hernia operation. But the subsequent fitting of a gastric band coupled with a healthy diet finally saw him reach a manageable weight. Super-sized Mr Martin seems to have no plans to follow Mr Mason’s lead, and tells a Channel 5 documentary, due to be aired next week, that his life of excess was triggered by the death of his mother when he was a teenager. Breakfast: Keith Martin typically starts the day with eight hot dogs and four slices of bread, or a pile of ham sandwiches followed by coffee with sugar. Lunch: A selection of chocolate bars, cakes, a packet of biscuits plus more coffees with sugar. Dinner: Two whole roast dinners with all the trimmings, or 16 sausages plus a family-sized bag of oven chips washed down with coffee. about what happened to me – I ate anything and everything,’ he said. Mr Martin has not had a girlfriend for 20 years and can no longer find clothes that fit him, as he is 5ft 9in with a six- foot waist. He relies on round-the-clock support from carers and relatives with his two sisters taking it in turn to carry out house visits. He spends his days watching television and gorging on sweets, cakes, biscuits and sausages. Mr Martin is one of several morbidly obese Brits to appear in the TV programme Big Body Squad, which aims to raise awareness of the plight of more than a million similarly overweight people who cost taxpayers millions of pounds in home help costs every year.